Title: "From The Dregs Of Defeat!" Dr. Sun, the mysterious cyborg who wants to capture Nova, monitors the progress of his plans. Dr. Sun's hologram of Diamondhead has lead Nova and the Comet to their foe's home. The cyborg plans to capture Nova to learn more about the Nova Prime Starship and its technology. Dr. Sun also reveals that he was responsible for Factor X's intelligence. After Nova's first appearance, Dr. Sun wanted to know more about the Human Rocket and Factor X allowed him the opportunity to discover the existence of the starship. As he's restating his plans, the cyborg's computer systems alert him to the fact that the Nova Prime Starship is experiencing a mysterious power-drain. Meanwhile, Nova and the Comet are engaged in a fierce battle with Diamondhead. After exchanging incredible, devastating punches, Nova is knocked unconscious and buried under a ton of rock. Diamondhead turns to the Comet and laughs at the hero's energy blasts. The super-villain grabs the Comet and hurtles him helplessly through the air. Diamondhead turns his attention to finding Dr. Sun and destroying him. The cyborg super-villain activates a remote control mechanism and gains control of a local bulldozer. The bulldozer digs through the pile of rocks and carries out Nova. The machine makes its way to Dr. Sun's laboratory and delivers the hero. At the same time, Factor X's pre-programming activates and the robot knocks out Nova's brother, Robert. Elsewhere, Mike Burley runs past Bernie Dillon and Ginger Jaye, Rich Rider's best friend and girlfriend. They wonder where Mike is headed but continue on their way to Rich's house. At the Rider's residence, Rich tells Ginger and Bernie that he's not feeling well and they should go without him. After the two leave, Factor X removes a Rich Rider mask and finishes his analysis of Rich's room! In another part of the city, Mike Burley meets up with the Comet who's just recovered from his battle with Diamondhead. Mike asks his friend why he disappeared back in the 1950's. The Comet agrees to answer his question even though it's painful to tell the story. Along with being a super-hero, the Comet was also a man with a wife and two children. After the criminal underworld discovered his identity, they offered a million dollar reward to anyone who killed the Comet. In his attempt to collect the reward, a masked man fired an explosive weapon into the Comet's house. The explosion killed the Comet's wife, Helen, and their children. It was during his recovery in the hospital that the Comet decided to retire. After leaving the hospital, the former super-hero became an alcoholic and homeless until Mike Burley rescued him. 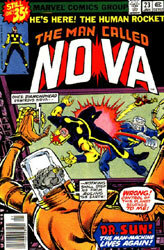 Meanwhile, Nova has recovered consciousness and finds himself facing Dr. Sun! Dr. Sun demands to be given access to the Nova Prime Starship and its computers. Nova refuses and the two begin fighting. The battle ends as Dr. Sun teleports them both to the Nova Prime Starship in Earth orbit. On board the giant ship, the cyborg explains that he wants to duplicate the brain-preservation process used by the Xandarians. He intends to use the knowledge to end his need for human blood. Although Dr. Sun has a robotic body, he requires blood to keep his human brain alive. Dr. Sun also plans on taking control of the starship and conquering Earth with it. Since Nova has served his purpose, Dr. Sun blasts the young hero into unconsciousness. He tells the Human Rocket that Nova's predecessor, Rhomann Dey, could have easily stopped him with powers Nova knows nothing about. As Dr. Sun begins his attempt to destroy Nova's mind, he is commanded to stop! A deep booming voice tells him that Nova is not to be harmed or he will perish instantly. Dr. Sun turns to find himself facing....the SPHINX!